A season that had been methodically slipping away for weeks was softly pushed over the edge Sunday afternoon at Paul Brown Stadium. Even at 3-6-1, Cincinnati remains alive for playoff contention thanks to the AFC North’s status as a bottomless pit of ineptitude, but only a fool would believe that the 2016 Bengals are destined to finish anywhere but somewhere on the spectrum of mediocrity. If the Bengals could not cobble together a complete game on Sunday with their season absolutely on the line—to be fair, the ‘must-win’ scenarios may have already passed—then when exactly should we expect that performance now? In spite of Marvin Lewis pleading with his past-their-prime veterans for one last stand, Sunday came and went without that uprising, and fans of the Orange and Black must now prepare themselves for an arduous winter. Things went horribly enough from the start: a sack of Andy Dalton by Cincinnati native Adolphus Washington for no gain; a false start by maligned right tackle Cedric Ogbuehi; and an incomplete pass to A.J. Green, who suffered a right hamstring injury on the play. Green left the field on a cart and did not return. With its offense reeling, the defense responded by stuffing the Bills and forcing a punt permitting Buffalo to mosey 85 yards to the end zone in seven plays, a march capped by LeSean McCoy waltzing untouched into the end zone. It was the fifth time in seven games Cincinnati’s once-stalwart defense had surrendered an opening-drive touchdown. To be fair, the Bengals defense was stingy the rest of the first half. They forced a punt on the Bills second drive, and after a Dalton interception was returned to the Bengals 3-yard line, the unit forced a field goal after a holding call on Buffalo wiped out a Tyrod Taylor rushing touchdown. The Bills advanced to the Bengals 22 on their final meaningful possession of the first two quarters, but Dre Kirkpatrick intercepted a Taylor pass to end that march. As for the Bengals offense, it responded well sans Green on its second drive. Dalton completed five passes to Tyler Boyd, Brandon LaFell, and James Wright, with the latter a recipient of a 15-yard pass on 3rd-and-14 to keep the drive alive while still deep in Cincinnati territory. Eventually Dalton plunged in from two yards out, before the increasingly-shaky Mike Nugent doinked the point-after attempt off the right upright. A robust 13-play, 66-yard affair on the team’s fourth drive was also capped off by a score on a lovely pitch-and-catch from Dalton to Boyd for the rookie’s first-ever touchdown—before Nugent delivered another party foul, drilling the right upright once again on his one-man quest to re-create the Gordon-Bombay-vs-Wolf-Stansson three-bar scene from D2: The Mighty Ducks. The Bengals 12-10 halftime advantage was a deserved lead, with the hosts owning a substantial edge in yards, first downs, and time of possession and converting six of their eight third downs. And yet, points were left on the board thanks to Nugent’s antics and the interceptions. As for the second half…well, I hope you missed at least a portion of that abomination by taking a beloved four-legged friend for a walk, frequenting a local coffee shop, or by trimming your lawn with nail clippers. What transpired on the field was not fit for the faint of heart. The totality of that crime against football comes to 37 yards gained on 17 plays, with just under seven minutes coming off the clock. The struggle made the Bills second-half offensive showing (two field goals, four punts) appear transcendent. By some act of divine intervention, Cincinnati actually had a chance to win the game when it received the ball trailing by four points on its own 15 with two minutes and 30 seconds remaining. Dalton did well enough to move the ball to the Bills 27, especially since he had to navigate a pair of crippling penalties by his offensive line. Under normal circumstances, the Bengals would have attempted a (likely futile) game-winning field goal, but thanks to Nugent’s pair of extra-point doh’s—Cincinnati’s place-kicker was far from the only culprit on Sunday, but his foibles critically subverted the Bengals, and it wasn’t the first time—Dalton was forced to attempt a failed end zone heave. 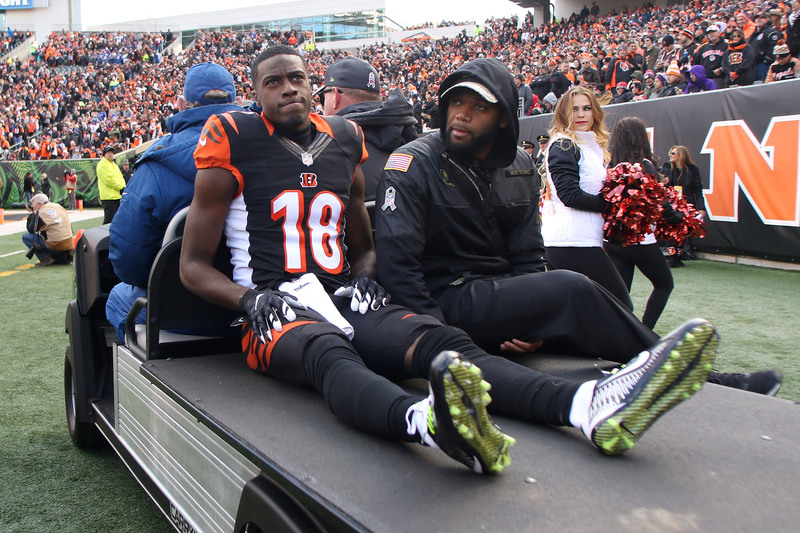 The previously-healthy Bengals left Sunday’s game in shambles. Gio Bernard reportedly tore his left ACL, which would not only knock the running back out for the rest of this season, but put his availability for the start of the 2017 campaign in serious jeopardy. Bengals.com reported that Green could miss the rest of the season while also noting that cornerback Dre Kirkpatrick suffered a knee injury that may require an extended absence. Safety Shawn Williams also left with a hamstring injury and didn’t return, and long snapper Clark Harris was visibly hampered by a groin ailment. Vontaze Burfict, never one to shy away from the drama, was forced to leave the game on multiple occasions, as well. It’s certainly possible that things could get ugly in Cincinnati—and fast. The Bengals still have three games remaining against the AFC North co-leading Ravens and Steelers, as well as a night game at the AFC South-leading Texans. However, a bottoming-out could be just what the doctored ordered for everyone involved with this franchise. In theory, this course of action would lessen the chance for half-measures to be employed after the season when it is crystal clear that this team has critical decisions to weigh going forward. And for a team that has not drafted higher than 17th overall over the past five seasons, the opportunity to select a youthful difference-maker in the front half of the first round (and the rounds that follow) is overdue for this team’s aging roster. Five-and-a-half years ago, the Bengals took Green and Dalton within the draft’s first 35 picks (and added starting guard Clint Boling with the 101st pick), establishing a foundation for a perennial winner and five straight playoff berths. But, again, the writing is on the wall with this current iteration. Things are already sour, and the various break-ups to come could make for an uncomfortable few months at 1 Paul Brown Stadium. “If it ain’t frustrating, I don’t know what to call it,” Adam Jones said postgame. “It’s just like when you go to work. However many hours you work, at the end of the week, you want to get paid, right?